We have a brand new village hall for our community and at the end of the month we're having our first ever craft fair. I've agreed to do some bits and pieces for a friend's stall and these fridge magnet sets are the first things I've made. Click any photo to enbiggan! I used glass cabochons and various paper ephemera cut with a circle die and stuck with Glossy Accents. I tidied up the backs with some acrylic paint and strong magnets were epoxied on once everything was dry. An out of date road atlas provided plenty of options for the map-based sets - I've gone local for three of them (Tynedale, Northumberland castles and coast and Newcastle upon Tyne) and done a London set as well. A local business sells paper packs made up of pages salvaged from books that are past being sold as complete items (because of damaged bindings, kids' crayon scribbles etc). I used sheet music from one of those packs for two sets. You might recognise the patterns on the other sets in this photo if you look carefully - they're the insides of "security" envelopes (the sort that contain bank statements etc - the patterns stop people reading through the envelope). I managed to find five different patterns for these. I think these were my hubby's favourites! 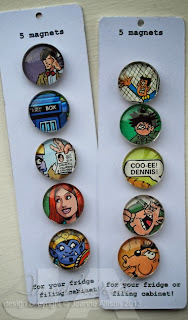 And finally I did a couple of cartoon sets. Denis the Menace came from the same ephemera pack as the sheet music and I had a Doctor Who magazine lying around that came from a charity shop so the cartoon strip from that got used here. 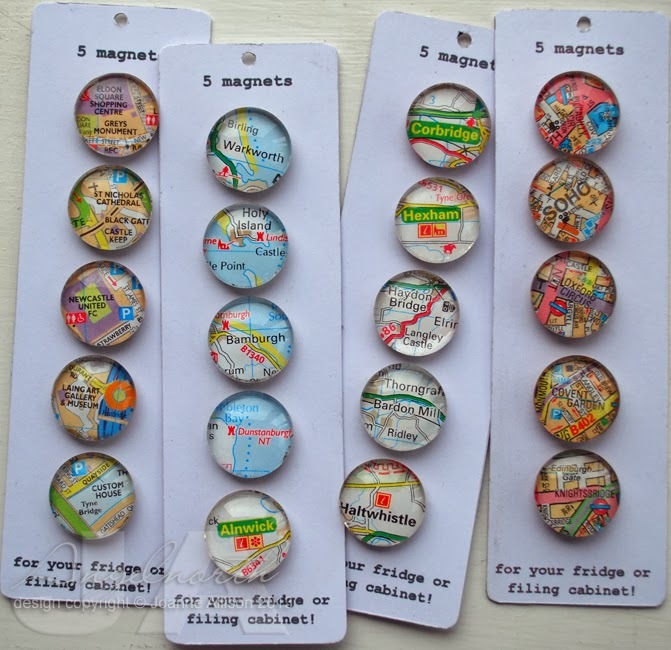 Packaging posed a bit of a challenge until I hit on the idea of cutting strips from the lids of soup tins and sandwiching them inside some cardstck - hey presto, magnets will stick no problem! I think they'd make nice little stocking filler gifts. Profits from anything I sell will be going in to the village hall fund, it's such a great resource for the community to have that I think a little support as it gets going is in order! These are lovely, Joanne. I would be hard pushed to know which one to buy. Oh wow! What a brilliant idea - they look fantastic! Totally awesome, Joanne. They're going to sell out fast, I guarantee it! Thes are fab and I'm sure they will sell well. Your choices for themes for the magnet sets are great. These are amazing Joanne! You have made them so professionally, as with all your makes. Good luck for the village hall, they are so welcome. What a fab idea! They look great Joanne! Love these, what a super idea. Hope everyone who goes to the craft fair thinks so too. Love your packaging idea. 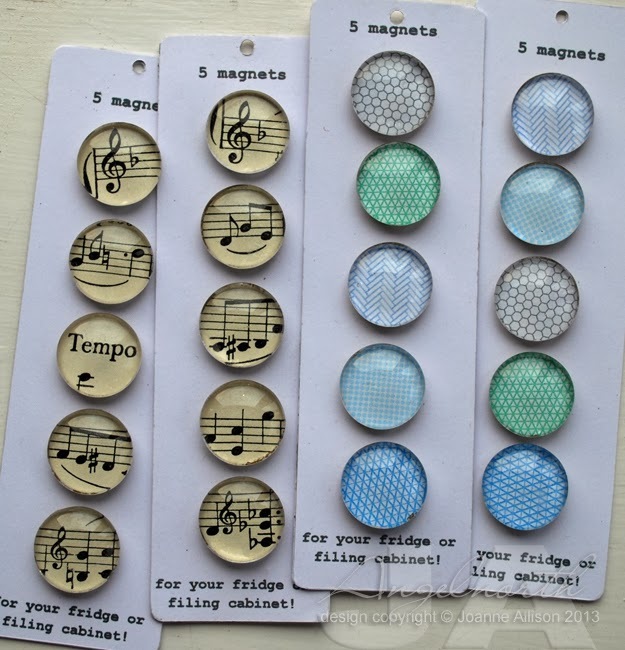 I love these magnets! 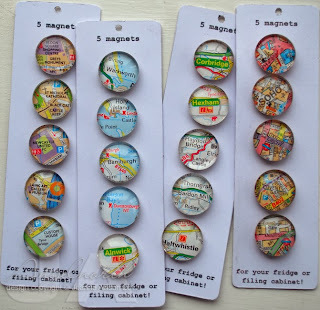 I have made magnets in the past using Stampin' Up! 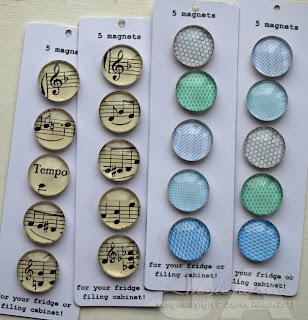 stamped images but love the idea of using old music and old book pages for my literary and musical friends. love these and I'm sure they will sell really well - good luck with raising money for the village hall fund. These are really original and hopefully they'll help the money raised go through the ceiling for the village hall, as I'm positive these will all sell. There's a design for everyone. I just thought too; wouldn't the music ones be great for people who read music? Aren't most music stands metal? They could use one of your magnets to help keep the book on the stand without the pages flipping over all the time.